Understand the community. Know who you’re pitching to. Know what you’re getting into. There’s a clear misconception that because you can contact all your friends and have them game the social news networking sites, you can submit content that doesn’t suit the community at all, instead focusing on self-promotional content that deviates from every rule in the book. I don’t consider myself a rockstar. I do, however, feel that I have a better understanding of the community to which I submit stories because I am not only submitting stories: I am actively engaging in the community. I am commenting. I am studying what’s been successful and what hasn’t been. It’s a completely different mindset than I had when I started using these social networks — simply because I had not given the networks and the users within a chance. When I spoke at SMX, I clearly articulated that I’ve Dugg over 18,000 stories. That number is now over 20,000. In other words, if you’re going to simply submit your own stories, vote your friends’ stories, and never actually know what the community wants, the chances of your success get minimized. You need to look at the stories that are submitted on a regular basis to understand what works and what doesn’t. Furthermore, to those who are aware of your actions and know of your affiliations, you look like an obvious gamer. Fifty Diggs in two hours is not practical unless you’re Engadget, Gizmodo, Tuaw, or have some serious breaking news to address. Your story on StumbleUpon won’t get 50 Diggs in 2 hours even if you’re giving away its source code. Did I not say that social media is a time investment? It is, my friends. You’re not supposed to simply invest time in asking your friends to promote your stories. You have to be a community participant with people beyond your circle of friends. You have to be involved with it and understand the culture. If you simply engage in spamming your friends with vote requests, it clearly shows that you won’t understand social media–unless you are ready to understand the community of people who participate in it on a regular basis. “Networking,” as you call it, and becoming a “rockstar,” does not happen just because someone knows a few people. It happens because these individuals have had determination and spend a considerable amount of time engaged in the sphere. If you’re looking for the same kind of success, perhaps you should too. Well said Tamar! Agree completely … it takes a tremendous amount of time. Would you take dieting lessons from a fat man? When you want the skinny on how to social network, take the advice from someone who knows. Wait, I just realised I am writing this in headline mode, lol. Man I gotta get out more. I think a big problem with the seo crowd, especially someone like me who dabbled with black hat techniques is that the easy route is the one to take, but it doesn’t work because social networking is all about building. Brick by brick you build your online image, your brand. Taking a short cut slash and burn method means your social media house never gets past the first line of bricks. That’s why all the new digg folks coming over to Stumble Upon is so funny to me…. 😉 Not sure many of them get the Stumble community. I heard you at SMX and it turned my head around – I get that Digg is just like the other networks that I actively engage in – I need to invest time and energy. 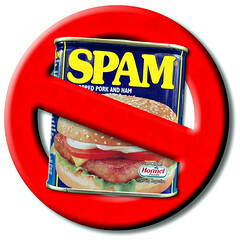 In the last few week, I’m getting spammed everyday – I can only imagine how much you get and how annoying it must be. BTW – still interested in having you come and speak to our team. You let me know if and when. It does take time — at least it used to. Recently I’ve seen a lot of gamming on digg. Every day I get a new gchat message from some random person in some random location looking to make a new digg friend for one reason only (take a guess). I see brand new diggers getting 60+ diggs in under an hour. I fear Digg as a community is falling apart — as a direct result of shouting and other social networking tools. time will tell. I’ve seen Digg go through plenty of changes and somehow it always corrects itself. Yikes! – Who is that clueless woman the picture? Thank you! I am truly beginning to understand this concept. Early this year blogging caught my attention as a way to journal online. I was journaling in a book which I still do. Technology makes blogging fun and a way to create a source of income. It does make since to understand what your community wants as well as the reason to be apart of a community. Great information! I’ve subscribed to your feed. Good Job! I’ve tried all the gimmicks and learned from Yaro Starak the very lesson you make here. “Invest the time getting to know the communities”. Because slapping a widget on your blog doesn’t equal traffic. All of the hot posts are either about getting your content on the front page of Digg within a week of signing up or about taking the time and gaining a following without spamming. Don’t these contradict? Within in all industry networks, building is super important for longevity. But within this industry it only makes sense to try and see instant gratification to clients and people who don’t fully understand. I fully agree with the building process. Thanks for the great post! I enjoyed your SMX presentation and am loving this site. I’m new to this world, but find it obsessively fascinating. Thanks for providing some education. It’s not just Sphinn, it’s pretty much everywhere …from private BH forums to whoever is the hot-blogger-du-jour. Building community -blog, forum, photo galleries, whatever- takes a helluva lot of work as editor/admin (and the Keeper of your vision). And that’s just the positive side. Add to the workload the continuous defending of the gates from trolls, bots, and the omnipresent Free-Speech-Is-My-RIGHT nuts and you’re looking at a really big job. Not so bad, you brought me here for understand the community. I will read page by page.